You will be amazed by the Happy Easter Store’s incredible selection of unique Easter gifts; 2011 will be the best Easter yet! 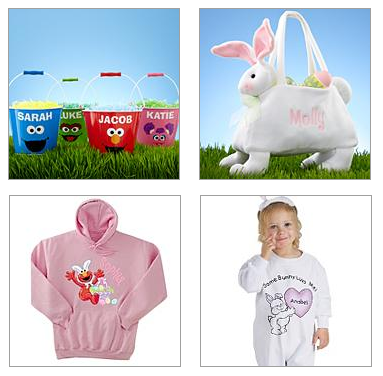 Browse our collection to find Easter gifts for toddlers, kids, and adults of all ages. We have Easter activity kits for kids, plush Easter gifts of stuffed animals, personalized all-in-one Easter baskets (pictured above), and a medley of small gifts for Easter baskets. Don’t forget gifts of home décor to get your house ready for Easter Sunday! I can hardly believe that Easter is just around the corner. While Winter felt like it dragged on forever here in the Northeast part of the country, it's still hard to believe that Spring is already upon us. With Spring and the Easter holiday comes all of the fun of being outdoors in the sunshine, and of course Easter Egg Hunting! FUN! There couldn't be a better or more convenient way to prepare for the Holiday, than with the Happy Easter Store! Packed with an incredible selection of gift choices for both little one's and adults, you'll also find everything you need to decorate your home for a Happy Easter! I couldn't be more thrilled with the quality of the product and the prompt friendly service! The Happy Easter Store 's selection helps to make Easter morning Happy and stress free (as it should be)! Ready to have a HAPPY EASTER?! One Lucky Reader will receive a $50 Gift Code to the Happy Easter Store! Leave a comment~ Visit http://www.happyeasterstore.com/ and let me know which item you would like to have. The comment is considered your entry. Entry to this giveaway ends at 12pm PST April 8, 2011. Winner's are chosen randomly through random.org. Winner's may not have won a previous Enjoy Lighting Giveaway. The winner will be announced in a post within 7 days of the giveaway ending, and contacted through email. The winner will have 48 hrs. to respond or another winner will be chosen. The plush animal easter baskets! So cute! I would use it to get this http://products.berries.com/flowers/Chocolates--Full-Dozen-Fancy-Berries-30045944?viewpos=4&trackingpgroup=ESCH&origcob=HES and I would add on & pay difference for a few of their chocolate bunnies. I would love the Easter Backpacks for my granddaughters! I follow on GFC as Ericka T. I'd get the Godiva Spring Ballatino. I am a gfc follower. I would like to have the chocolate on chocolate cupcakes. I'd like to have the All in One blue Easter basket. I entered your Umi shoes giveaway. I like the Polka Dot Basket with Bunny! I would love the baby's first easter gift as my baby being born in 5 days will be having his first easter soon! I entered your Betty Crocker/Laptop giveaway. 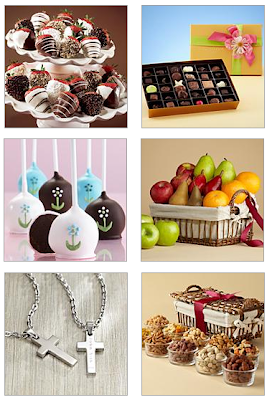 I think I'd pick the Rocky Mountain Chocolate Collection - I can't resist chocolate!